Choose from our collection of Amish Child Wooden Table and Chair Sets. And give your kids and their friends the opportunity to color, play and eat together at their own child-sized table. The finest Amish craftsmen in the Midwest painstakingly build each Amish Child Table Set. Also, the Amish men use sturdy hardwoods. Plus the same attention to detail as when they build ‘grown up’ dining sets. So that’s your assurance of sturdiness, durability – and long life. Browse our online selection of Amish child table sets. And discover which one is best suited for your kids and their pals. Child’s Royal Mission Table Set The original Child’s Royal Mission Table Set blends a mission style with a modern look creating lasting elegance for your child’s play room or eating area. Wood Choices Cherry Oak Quarter Sawn Oak Contact Weaver Furniture Sales to customize this table and chair set. Child Table and Sheaf Chair Set Wood Options: Oak Cherry Brown Maple Child Table and Sheaf Chair Set Measurements (inches) Table: 24 W x 30 L x 21 H Chair: 14 1/2 W 13 D x 26 1/2 H Visit our Shipshewana Furniture Store to see more Wooden Home Furnishings. How do you build table and chair sets for kids? If you’re Amish cabinetmakers, you’d use the same materials and painstaking craftsmanship as you would building grown-up dining sets. And this is the caliber of custom child dining sets we offer. 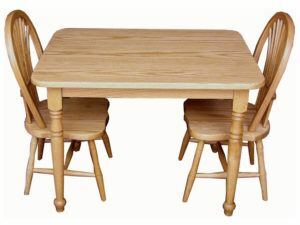 In fact, solid hardwood custom construction makes Amish child wooden table and chair sets from Weaver Furniture Sales far superior to what you’re likely to find in most big box stores or traditional furniture stores. So for kid’s dining sets that’s sturdy enough to serve several generations of kids, take a closer look at our selections.